Can You Fix a Bucking Horse? 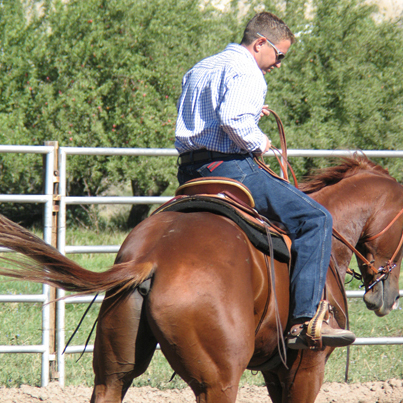 "Fixing a bucking horse may or may not be something you can fix - it might be time to call in a pro. Here, I'll help you decide for yourself." Pros know that with bucking it's never a matter of "I school the horse on this and that and when he shows me this or that I'll know I've dealt with it." Nope, they'll work from the ground to instill respect... they do everything they can think of... then they get on and hope for the best. I'll say it again. They've done everything they can think of - then get on and hope for the best. Think about that before you decide to tackle something like this yourself. There simply are no assurances. Same goes for work from the horse's back: A professional trainer is going to put your horse through every exercise he knows to address the situation (after all, his health depends on it), yet still ride around hoping nothing "sets him off" before the schooling can sink in and lasting changes are made. So what are you to do? If you are an accomplished rider willing to chance (or tough out) a few launches into the dirt, then you might want to pick up every book or video you can find dealing with the subject, to consult more knowledgeable riders for advice and maybe even pay a pro to come coach you as you attempt the fix yourself. (Don't forget the helmet.) But, if this is not you, then stay off the horse and call a professional. (Get references first.) You'll still want to learn everything you can because the deepened understanding will help you prevent further/other issues. You'll also want to know why the pro you're paying does what he does so that the two of you can work together towards a lasting remedy. Too often I see non-professionals think they can fix this themselves by applying prescription A or B out of some book or video and ride comfortably one week later. Now, this might very well be true of bolting or rearing because their "fixes" are more obvious and structured (and proof that a fix has been obtained can literally be observed through the horse's actions), but bucking as an issue is more nebulous and fixing it is something you should take a pass on if you're not already an experienced rider. Instead, learn all you can to deepen your understanding of the issue... then call a pro. What's a few months with a trainer up against five or six grand for a day trip to the emergency room? Now, look, I'm not trying to harsh your mellow here. If you've got an up and comer problem-child colt in the backyard and feel that you've got what it takes (after reading this and everything else you can get your hands on) to turn him around, then more power to ya. However, for the rest of you, pros are a great resource. Professional trainers have the experience to (more often than the non-pro) see a dangerous incident brewing. They can quickly change course and avoid the insurrection. Beyond that, they've built in the reflexes it takes to act quickly to shut down a buck and the muscle memory to sit it if necessary. Some even specialize in this sort of thing. Weird, I know - but they're out there. ​Noted gadabout town and TV writer in his earlier years, Certified John Lyons Trainer Keith Hosman is the author of ten horse-training books published in four languages.